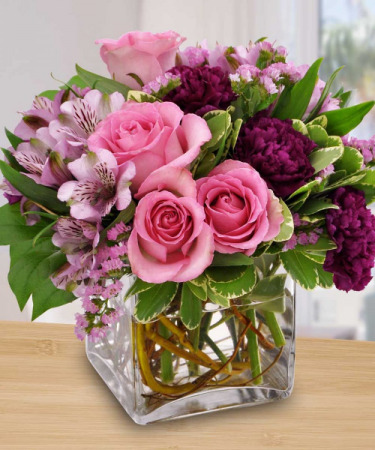 Pink Roses, Violet Carnations, Pink Statice, Lavender Alstromeria with Salal and Varigated Pittsoporum in a clear square cube vase. 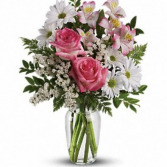 Blush Roses, White Daisies, Blush Alstromeria with Statice in a Clear 9 3/4 inch Bouquet Vase is a perfect gift for your "Dear Friend". 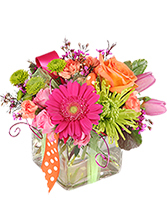 SOLD OUT FOR MOTHERS DAY Clear cube with fresh and bright flowers with a punch of happy color. 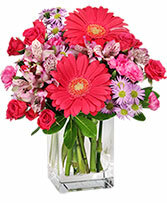 Price One is a four inch cube Price Two is a five inch cube Price Three is a five inch cube with additional gerbera daisy. Ribbon will vary.